A few days ago a video surfaced of one YouTube user comparing the abilities of Apple’s Siri and Microsoft’s Tellme software. With Siri found on the new iPhone 4S and Tellme being part of Windows Phone 7, it was really only a matter of time before the two were compared head-to-head. Microsoft’s own Craig Mundie didn’t help proceedings when he merrily exclaimed that Siri wasn’t anything special, and that Microsoft had actually beaten Apple to the punch. During the first video, Siri battered Tellme into submission with its understanding of natural language, not to mention the videographer’s Australian accent. Many deemed to to not be a fair test, saying that despite Mundie’s claims, the two technologies actually work very differently. This has led to another video being made by Response LTD which again shows Siri and Tellme being put through their paces for our enjoyment. While the outcome is still very similar – Siri is undoubtedly the king when it comes to understanding natural language and then kicking out a usable response in a fancy manner – Tellme is not without its strengths. Both systems make a good fist of deciphering the user’s Hungarian accent, which is interesting considering it struggles with my Northern English one! 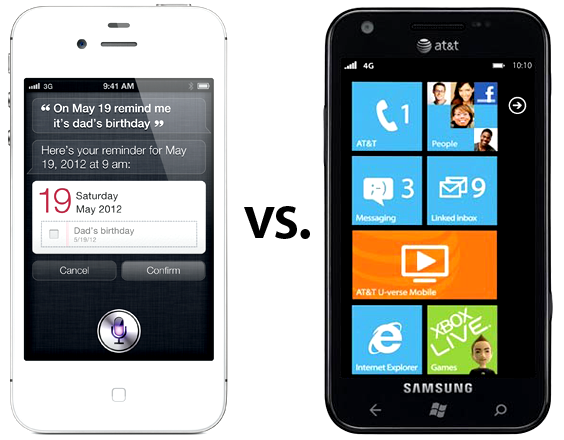 One area which the Windows Phone 7 device wipes the floor with Siri is in the way it can launch applications. For some reason that only the people inside 1 Infinite Loop understand, Apple decided not to allow Siri to interact with third-party applications. In fact, Siri can not even open an application, which is the single most requested feature across the entire internet. Just add that, and Siri becomes infinitely more usable. Apple, what were you thinking? This new video serves as a healthy reminder that Apple is not the only company that is working with new technology and trying to bring it to smartphones. If Microsoft is also clearly thinking along the lines of users interacting with their technology via voice – Xbox Kinect, anyone? – then surely it is only a matter of time before Google’s own dictation software morphs into something a little more interesting, right? Time will tell, but voice control could well be the next big thing in smartphones, or any technology for that matter. That’s assuming it isn’t already.